• Distill and prioritize sweeping amounts of security alerts and identify alerts that should be escalated to IR teams using Kaspersky Threat Data Feeds and their context. Personal health information is private and precious. Medical organizations and healthcare professionals hold this data in trust – but is that trust justified? Yuri Namestnikov and Denis Makrushin, security researchers at Kaspersky Lab, have analyzed public sources and uncovered a number of vulnerabilities in healthcare organizations that threaten data. Join the webinar to learn how to secure your business perimeter. The art of cyber-threat hunting keeps businesses aware of recent or upcoming threats, and enables them to protect the organization from attacks and breaches before it's too late. But what if criminals go totally under the radar? Vicente Diaz, security researcher at Kaspersky Lab, will present the most recent trends in the world of cybercriminals and how they avoid even the most sophisticated threat hunters. Join the webinar to learn how to harvest intelligence when the criminals are completely in the shadows. An international panel of leaders and influencers from across the security landscape will explore how the global ICT industry can best build trust and assurance for their products in the current cybersecurity landscape. Among other things, the panel will discuss the need to prove trustworthiness and the risks and benefits of transparency actions such as code reviews. • Anton Shingarev, Vice President of Public Affairs, Kaspersky Lab. Experts predict a busy year for cybersecurity threats… a rise in general and accidental malware infections, an increased risk of targeted ransomware attacks and new types of malware and malicious tools all lie ahead. Threat intelligence is a key component of any effective security operation. Without exceptional, coordinated threat intelligence, cyber threats simply can’t be reliably identified or stopped. Kaspersky Lab is hosting a webinar on the key role of threat intelligence in an effective security operation. The webinar will be presented by Oleg Glebov, solution leader for our Threat Management and Defense portfolio and Alexander Liskin, Kaspersky Lab anti-malware research expert. The webinar is aimed at anyone with a professional interest in cybersecurity and threat intelligence, in particular IT security officers, incident response specialists and SOC analysts. 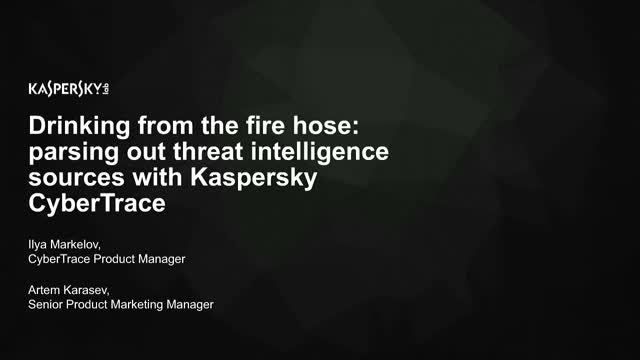 • Kaspersky’s Threat Intelligence Services – and how we can help build a comprehensive Incident Response (IR) framework with our Threat Intelligence Portal and Cloud Sandbox. When it comes to discussions related to fraud, we think about the finance first. Financial institutions historically have suffered the most being the targets of various criminal schemes, malware, social engineering, money laundering and other fraud vectors. However, nowadays we see that organizations across different industries are suffering reputational, financial and other damages caused by fraud. Government agencies, healthcare organizations, retail and e-commerce, loyalty schemes, gaming industry and gambling rooms report cases of account takeover, new account fraud, even money laundering related attacks. Most of them have fraud prevention measures in place to fight or at least to monitor this. But fraud has evolved into a form of organizational crime and attackers offer training and knowledge sharing to help find a way past well-known fraud management solutions. At the webinar we are going to cover the most up-to-date threat landscape for different types of businesses and share some real cases of success. In the digital world, effective information security is now a key business success factor. As attackers find new ways to attack digital assets, the ability of the organization to maintain continuity, and the security of the information circulating in it, may be called into question. New attack methods and threat vectors require fundamentally new approaches to corporate protection. As part of the World Cyber Security Congress in London on March 27, Kaspersky Lab will be conducting a seminar exploring ways to solve the problem of protection in the digital world, where the risks are so high, and where the only sure defense lies a comprehensive security approach. During the seminar, our Principal Security Researcher in the Global Research and Analysis Team David Emm will talk about contemporary threats in ‘The Top Cyber-threats Facing Your Digital Business’. Next, in ‘Cybersecurity as Part of Your Digital Transformation Strategy’, Adam Maskatiya, General Manager, Kaspersky Lab UK & Ireland will outline how to build a cybersecurity system able to respond to highly complex threats. The seminar will end in conversation - CTO one of our customer talks about their success story in fighting today’s cyberthreats. Isn’t it funny how biometrics, a science that has been around for centuries, did not enter the public consciousness until Apple launched Touch ID with the iPhone 5S in September 2013? Now it is seen by many as the solution to our fraud concerns. Of course, this technology, like any other, whilst offering tremendous potential, is not the be-all and end-all of fraud and cybercrime prevention. In this presentation we will look at why Artificial Intelligence and behavioural biometrics, on their own, are not the answer to all your cybersecurity woes. Kaspersky Lab will share its predictions for what the world’s major threat actors could have planned for the coming year. The webinar will explore some of the key trends in terms of tools, techniques and processes likely to be used by such groups against government organizations, enterprises, critical infrastructure, society at large, and more – and consider what that means for organizations, the security community and international cyberspace. The aim of the webinar is to stimulate debate among IT security professionals in all industries and to increase awareness and understanding that will help them to defend their organization against these threats. On May 7, 2019, Kaspersky Lab ICS CERT experts will conduct a webinar focused on a specific type of attack on industrial facilities, where remote administration tools (RATs) have been used or involved. This is a rapidly emerging threat today for ICS facilities, so it is vital to raise awareness and inform businesses how it can affect them. The webinar was originally broadcast in October 2018, yet the recording was lost due to technical issues. Following demand, Kaspersky Lab ICS CERT experts will present the webinar again, this time with updated relevant statistics. Kirill Kruglov and Vyacheslav Kopeytsev, security researchers in Kaspersky Lab's ICS CERT, will examine a number of real-world incidents which have been investigated by fellow ICS CERT experts. RATs are useful tools, often used by both system administrators and contractors. However, today there is a real risk that the RATs themselves, or the paths created for them, are being increasingly exploited by threat actors – especially against ICS. Finally, Vyacheslav and Kirill will discuss statistics from the Kaspersky Security Network and present a few mitigating strategies for industrial environments where RATs are used. For example, Kaspersky Labs offers an ICS Malware Data feed, which helps identify malicious uses of RATs. There will be a Q&A session after the presentation. Join our jargon-free kick-off session to find out what some of the most sophisticated threat actors were up to: their tools, techniques and targets, and how to spot and combat them and keep your business safe. Kaspersky Lab experts will present their review of advanced persistent threat activity in the first quarter of 2019. They will chart the latest campaigns, tools and techniques deployed by established and emerging threat actors, including a major supply chain compromise, newly discovered cyberespionage operations and the relentless persistence of financially motivated attacks. To get ahead of endpoint cyberthreat complexity and protect their organizations, enterprise security and risk professionals must prioritize threat prevention and detection technologies that don’t require constant maintenance and overly manual workflows. In this webinar, attendees will learn how to identify the right combination of automatic and manual technologies commensurate with their security team’s level of expertise. This will put them in the best position to combat modern threats while also decreasing the amount of friction within their own security organization. Kaspersky Lab and top security leaders. The summit will feature a presentation by Amin Hasbini, a top security researcher in Kaspersky Lab’s elite Global Research and Analysis Team, on the threats and threat actors that are likely to target enterprises in 2019 and beyond. This will be followed by a panel debate that will consider how the rapidly evolving cyberthreat landscape, new technologies such as AI, and geopolitical change will affect enterprises across all business sectors in an increasingly ultra-connected world. Kaspersky Lab will present an exclusive overview of the top cyber-threats targeting financial services, based on the company’s threat intelligence research in 2018. The webinar will be helpful for those who wish to know more about current ICS cyberthreats. The webinar’s speaker Kirill Kruglov, senior security researcher at Kaspersky Lab ICS CERT, will talk about major threats relevant to industrial control systems that Kaspersky Lab ICS CERT identified in H2 2018. In addition to discussing general statistics on malicious attacks that were detected and prevented by Kaspersky Lab products on industrial computers globally, he will offer a deeper dive into the attacks we saw, TTPs used by attackers, and root cause analysis of major security weaknesses we discovered. In addition, Kirill will discuss the methodology used to collect and analyze the data, which will help the webinar participants to better understand what these figures mean. Do your employees enjoy security training? Right, no one does. Meanwhile 80 % of cyberincidents are caused by human errors. Cybersecurity is seen as an imposition, a limitation on personal freedom, while it is a critical risk for organizations. Employees' business goals and Security objectives often appear to be contradictory. The right approach to developing cybersecurity awareness can solve this dilemma.